Protestant reformer Henry VIII was responsible for Tyndale's death. "Way to go Doc; you change Protestants into Catholics in order to smear the very Church founded by Jesus and the Apostles." 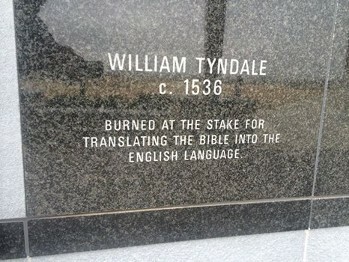 A gentleman by the name of Doc House showed this photo of a burial marker for William Tyndale. He then goes on to speak about "the foul Church who put Tyndale to death." He and many others blame the Catholic Church for this atrocity. Doc House failed history 101 when he brought up Tyndale. What he doesn't mention is that this foul Church would have been the Anglican Church, whose leader was the Protestant reformer, Henry VIII. This Protestant was the one who murdered Tyndale and many other Catholic Bishops, priests and Protestants (Anabaptists) as well. When this was brought to Doc's attention, to his credit, he removed the false information. More recently, I read a number of different articles from Protestant sources that were condemning the Catholic Church for murdering Tyndale. Did they really not know that Henry VIII, like the other Protestants, was in rebellion against the Catholic Church at the time of Tyndale? Along with the Catholics, Henry VIII and other Protestants at the time opposed Tyndale’s Bible, not because they were opposed to his Bible, but because of its many errors. “St. Thomas More commented that searching for errors in the Tyndale Bible was similar to searching for water in the sea.” There is this mistaken notion that the Catholic Church was opposed to the reading of the Bible. The murder of Zwingli, who came up with his own Bible translation in English was just one more case in their failed attempt to prove that the Church opposes the Bible. The message based on the false information presented is this, if you're Catholic, come out from that awful Church that disregards the Bible. What they don't realize is that that the Catholic Church is the most Bible believing Church on the face of the earth. "Tyndale died not for the right to read the Bible, as many Protestants arrogantly claim. He was put to death by the civil judges of the father [Henry VIII] of the English Protestant Deformation, for doctrines subversive of law and order, which Dr. James Gardiner, Protestant, said "was intended to produce an ecclesiastical and social revolution of a most dangerous character. . ."
Some authors claim that the real reason Henry VIII had Tyndale put to death is because he would not approve of Henry’s marriage to Ann Boleyn. The Catholic Church also disapproved of Henry's marriage to Ann. This is the reason for the existence of the Anglican Church. Henry, in retaliation, kicked out the Catholic Church and any Catholic priest found loyal to the Church suffered greatly. Henry VIII became the head of his own church. Priests and Bishops, loyal to the Vatican as well as the Protestant Anabaptists were put to death by Protestant Henry VIII. Even today, they are still finding the hiding places of Catholic priests in centuries old buildings. When these priests were not in hiding, they were saying Mass and administering the sacraments. Their sentence, when caught by Henry VIII, was torture and death. One of Protestant Henry VIII victims was Saint Thomas More, because he wouldn’t accept Henry’s Marriage to Anne Boleyn. More was sentenced to the traitor’s death “to be drawn, hanged, and quartered”—which the king changed to beheading. During five days of suspense, More prepared his soul to meet “the great spouse” and wrote a beautiful prayer and several letters of farewell. He walked to the scaffold on More ascended the scaffold on July 6, 1535, joking to his executioners to help him up the scaffold, but that he would see himself down. The mistaken notion that the Catholic Church murdered Tyndale is found in many articles on the internet. And this corrupt information is also used as a wedge to get people out of the Catholic Church and into the Evangelical Churches. However, this can and does have its own undoing when people find out they were fed anti-Catholic misrepresentations that were far from the truth. These same people are often times embarrassed when they realize that they were led out of the Catholic Church under false pretenses. Some of these people come back to the Church a little wiser than before.